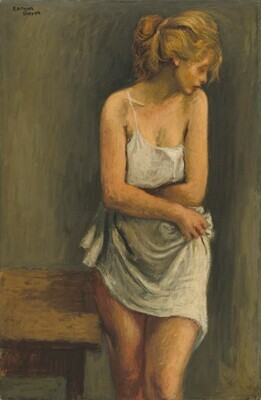 James N. Rosenberg [1874-1970], New York; gift 1947 to National Collection of Fine Arts (now Smithsonian American Art Museum), Washington, D.C.; transferred May 1989 to NGA. 1947 gift stipulated that the painting was to be transferred to the National Gallery of Art twenty years after the artist's death, or "when eligible" to enter the collection. American Artists from the Russian Empire, Fred Jones Jr. Museum of Art, The University of Oklahoma, Norman; The State Russian Museum, St. Petersburg; State Tretiakov Gallery, Moscow; San Diego Museum of Art, 2008-2010, no. 53, repro. American Paintings: An Illustrated Catalogue. National Gallery of Art, Washington, 1992: 339, repro.